Asia Pulp & Paper workers classify 3-month-old Acacias in Dingan, northeast Hainan province, China. Trees are cloned to yield more pulp. In silent temperature-controlled labs in a desolate part of Hainan, China’s most tropical province, rows of women in medical masks and lab coats clone trees that grow freakishly fast. The trees have official names, such as APP-22 or DH32-29. But Wending Huang, Asia Pulp & Paper Co.’s chief forester in China, calls them his "Yao Mings" – after the towering Chinese basketball star. The tiny green tissue samples, methodically implanted in Petri jars, will become hardwood eucalyptus trees that need only four to six years to reach full height, up to 90 feet or more. "And then we harvest," said Huang. Each year, Huang’s labs clone 190 million ready-to-plant "cutlings," which APP grows on 790,000 acres of managed timberland spread over eight Chinese provinces. The company cultivates fiber-rich hardwood as intensively as U.S. agribusinesses grow gene-optimized corn and wheat. The test-tube forests have helped undo the longstanding natural advantage of papermaking states such as Wisconsin, where hardwood trees are plentiful but can take up to 10 times as long to reach harvesting height. What’s more, boosted by billions in government subsidies, China has been building massive new mills with automated machines that can produce a mile of glossy publishing-grade paper a minute. At a time when Wisconsin’s paper mills were already fighting off a digital death, China has become a sudden, potent adversary – a threat even greater than the rise of laptops and the iPad. China came to dominate the manufacturing of electronics hardware and touch-screen technologies by marrying cheap labor with sophisticated engineering and automation – able to adopt design changes and adjust to demand shifts virtually overnight. In a move that has attracted far less attention, China has brought that same approach to paper. Over the course of the last decade, China tripled its paper production and in 2009 overtook the United States as the world’s biggest papermaker. It can now match the annual output of Wisconsin, America’s top papermaking state, in the span of three weeks. Paper makes for an exceedingly unlikely focus. After decimating its natural forest cover decades ago, China lacks a fundamental necessity for printing-quality paper: wood pulp. So China created the industrial-scale plantations. And it created the world’s biggest and most efficient recycling scheme. It now buys some 27 million tons of scrap paper and used cardboard from around the world each year, then de-inks and re-pulps it for about two-thirds of its own paper and cardboard production. But that is still not enough – for China’s needs or its ambition. China imports the vast majority of virgin timber and processed pulp from around the world – 14.5 million tons last year alone from places like Russia, Indonesia and Vietnam. China has so disrupted the market that 1.6 million tons came from the United States, where loggers and pulping operators are left searching for new customers when local mills close. That all has earned the ire of environmental groups, which say China’s insatiable appetite for wood pulp is destroying the world’s forests. It has drawn the fire of Wisconsin politicians who accuse China of unfairly subsidizing its mills and dumping paper on the U.S. market, putting state operations out of business and an entire industry at risk. With 20 modern mega-mills spread across China, Indonesia-based Asia Pulp & Paper is at the center of the accusations. It is an unusual place to find a guy from Wisconsin. Jeff Lindsay, 52, is a 20-year veteran of Wisconsin’s paper industry who was recruited by APP in 2011 to run its growing portfolio of patents. He holds a doctorate in chemical engineering, was on the faculty of the now-defunct Institute of Paper Chemistry in Appleton, and later joined Kimberly-Clark Corp., which gave the world Kleenex. He holds 130 patents and co-authored a 2009 book, "Conquering Innovation Fatigue," which took aim at barriers to U.S. innovation. He now works from a ninth-floor office in APP’s China headquarters in Shanghai, a gleaming skyscraper topped with a multicolored crown that lights up at night. He feels at home in the horn-honking bustle, the labyrinth of tightly packed street merchants and seafood peddlers, the rush of a city of 13 million. He likes its feel of the future, the pace of change, living in "the epicenter" of Asia. To explain it, Lindsay starts deep in the past. Paper was invented in China (105 AD) and remains a potent national symbol. It is taught in Chinese classrooms as one of the four "great inventions," along with the compass (200 BC), gunpowder (850 AD) and printing presses with movable type (1313). "These inventions came from China," Lindsay said. "When people go pointing their finger at the Chinese paper industry or saying we shouldn’t be buying paper from China – paper came from China." The West, he says, is in denial about the competitive edge offered by Chinese science, engineering and ingenuity. And Wisconsin’s paper industry, he says, has lost the culture of investment, innovation and risk that defined it in the last century. "You can only get so much from an old machine," Lindsay said. "And only so much from your trade tariffs or whatever else you are doing to protect your product from lower-cost products from elsewhere before you eventually have to face the reality. "You have to innovate to survive in this world." But China’s success is not nearly that simple. It does not explain how a Wisconsin tree can be cut down, turned into pulp, trucked to a port, shipped 7,000 miles around the globe and come back as paper less expensive than that produced in the mill a few miles away. The Washington-based Economic Policy Institute estimates the Chinese government doled out at least $33 billion in subsidies to its paper industry from 2002 to 2009 – the period that coincides with its stunning growth. That’s more than $4 billion a year, a number that is growing. The entire annual payroll for all of Wisconsin’s mills – including those making paper towels, tissue and cardboard – is $2.4 billion. In China, there is government support at every step of the process – money to create plantations, import raw materials, build new equipment and power the mills. Subsidies support 30% of the total annual output of Chinese paper mills, according to Usha Haley, a New Zealand economics professor and author of "Subsidies to the Chinese Industry: State Capitalism, Business Strategy and Trade Policy." She notes raw materials represent 35% of the production cost of Chinese paper: "If the Chinese are buying those at world prices, how is Chinese paper selling at a substantial discount compared to U.S. or European paper?" To be sure, there are grants, loans and tax breaks in the United States, typically aimed at boosting individual operations. The largest, in effect from 2005 to 2010, was for an alternative fuel known as black liquor, a byproduct of the pulping process. The subsidy averaged $280 million a year when it was in effect, about 7% of the size of the annual Chinese subsidy to its paper industry. The intensity of China’s drive to be a paper power can be seen clearest in Asia Pulp & Paper’s plantations, 1,300 miles south of Shanghai in Hainan. The island province is on the same longitude as Vietnam and Thailand. It rains about once a day, but otherwise basks in tropical sunshine, perfect for the eucalyptus trees, themselves an import from Australia. The plantations are at least two hours from the nearest city, by way of dusty roads populated with water buffalo, wild pigs, goats and clattering motorbikes. The labs, in the shadow of a faded water tower, are not fancy. Women from nearby villages have been trained to clone the trees and prune and tend to the precious cutlings, wearing straw hats to guard against the hot sun. Wisconsin’s mills long competed with those in other states and Europe that had a similar northern climate. In time, countries such as Brazil and Australia turned to eucalyptus plantations, but not with the assembly-line intensity of China. The APP plantation land was once considered "degraded" – all sandy soil with scrub vegetation. Now eucalyptus trees stand straight as matchsticks, with no branches apart from a tuft of leaves at the top, meaning less waste and more pulp. The trees that grow fastest are crossbred with others to grow faster still, then re-cloned and planted – equally spaced – in symmetrical rows that APP’s scientists found optimize growth. On a misty September day, Wending Huang – on a break from the labs – tours one of the plantations. Huang, who earned his forestry doctorate in Finland and taught at universities there before coming home to China, stops and hugs one of his "babies." "The quality of pulp is good," he says. "The cost is lower because the tree grows fast and you don’t need to import so much." And even faster-growing forests, he says, are not far off. "The super Yao Ming will be coming." China, with its chronic timber deficit, is a newcomer to renewable forestry. It’s an approach pioneered nearly a century ago in Wisconsin – the harvesting of only mature trees and planting more than are cut. Wisconsin found religion after decades of clear-cutting threatened the survival of the state’s paper mills. In China, the turning point came in 1998 when the Yangtze River flooded after loggers had stripped valleys of trees. Towns and cities were flooded, killing 3,650. Beijing cracked down with national logging bans and forestry reforms. At the time, China was beginning to see itself as a global superpower, but the country relied on thousands of old and environmentally destructive mills that used straw, rice stalks and bamboo to produce flimsy paper. A knowledge-driven economy required "knowledge grade" paper – paper for dictionaries, textbooks, encyclopedias. Beijing rewrote its environmental regulations, raising the bar so high for the small dirty mills that it drove them out of business. They were replaced by scores of gleaming new mills, bolstering an industry designated of "great strategic and economic importance" in Beijing’s five-year plans. In a capitalist economy, the demand would come first, followed by investment to build the capacity to meet it. In communist China, the scenario was flipped. And the nation’s giant new mills needed to be fed. China began importing from Indonesia and Russia – countries that international environmental groups warn do not follow renewable-forestry practices and where wood is known to be traded on the black market. The World Bank estimates illegal logging is a $15 billion-a-year enterprise. "Much of the fiber going into Chinese mills is coming at the expense of Indonesia’s rainforests," said Linda Walker, forest program manager for the World Wildlife Fund, which uses satellite imagery, contacts on the ground and fiber analysis to determine the source of the wood used in paper. There is no real estimate for when China’s plantations might be enough to feed the nation’s mills, if ever. APP says it will no longer need to use the world’s natural forests by 2015, but the company has already missed past goals of 2004, 2007 and 2009. 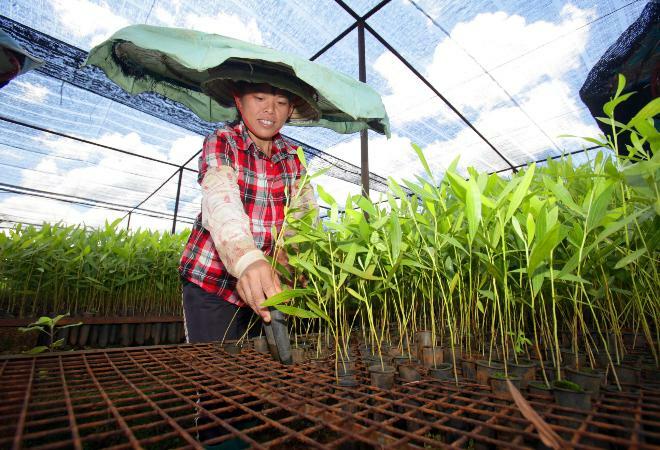 In the meantime, thanks to the eucalyptus plantations, China led the world in reforestation from 2005 to 2010, according to self-reported numbers compiled by the United Nations. At the same time, other nations continue to lose forest cover to China’s paper mills and furniture factories. A year later, office supply chain Staples Inc. cut all its ties to APP, citing "great peril to our brand." Next came the Asian operations of Kimberly-Clark, which declared it never purchases pulp from APP "because the sustainability of the product is open to question." The Forest Stewardship Council, considered the gold standard of third-party certification for sustainable forestry, has severed all ties with APP, the only time the group has taken such an action. A spokesman for the group puts it simply: "The environmental community considers APP the most destructive forest products company in the world." In 2007, Cerberus Capital Management LP, one of the world’s largest private equity firms, bought six Wisconsin mills, renamed the company NewPage Corp. and instantly became North America’s biggest producer of glossy coated paper. The new name carried more optimism than reality. Within a year, NewPage had closed two of the mills and about 1,000 jobs were lost. One was the 110-year-old mill in Kimberly, a city named after a founder of Kimberly-Clark and so tied to the mill that its high school sports teams are nicknamed the Papermakers. In September 2010, Kimberly became Exhibit A in a pivotal hearing before the U.S. International Trade Commission, which can impose duties on goods from other countries to diminish their threat to U.S. products. The allegation: China dumps exports of glossy coated paper at prices below cost and unfairly subsidizes new ultra-modern mills with tax breaks and cheap government loans. NewPage CEO George Martin told the six trade commissioners that low-cost paper from China and Indonesia was crippling his mills. "There is no doubt in my mind that we would have kept Kimberly up and running," he said. "The decision to shut down Kimberly was due directly and unmistakably to the pricing pressures from the subject imports and the loss of millions of dollars in sales and revenues." The hearing thrust paper to the center of a contentious trade relationship with China, one that has become defined by U.S. borrowing and buying. China essentially lends money to the United States by buying bonds that fund the budget deficit. U.S. consumers, in turn, buy Chinese products. The trade deficit last year was a record $295 billion and continues to grow. That gives China a strong hand in any economic negotiations. Imposing tariffs is especially delicate, each action weighed against the likelihood of retaliation. Hours of testimony came from economists, paper industry officials and politicians – two senators each from Wisconsin, Maine and Minnesota. Lawyers and lobbyists for APP watched from the gallery. In 2007, the trade panel had rejected a Wisconsin-led complaint. This time it voted 6-0 to impose tariffs on coated paper from China and Indonesia. "A major win for Wisconsin," declared Democratic U.S. Sen. Herb Kohl. The view from China is different. They see NewPage as a company that did not invest to stay profitable, that churned through five chief executives since 2006, that is owned by the same private equity firm that in two years took Chrysler into bankruptcy. "NewPage was looking for a way to survive and they were blaming a lot of their poor performance on imports," said Terry Hunley, acting president of APP’s North American operations. Since the tariffs took effect, the value of imports of Chinese coated paper to the United States has fallen from $288 million in 2009 to $84 million last year. The sanctions, and ones that followed a year later from the European Union, have created some breathing room for mills in Wisconsin and elsewhere. APP is determined to dismantle the tariffs and has appealed to the Court of International Trade, while China has pressed the case with the World Trade Organization. And industry projections show demand for publishing-grade paper plummeting, a result of the accelerating digital shift. Two months after the tariffs were approved, NewPage closed its mill in Whiting. A year later, in 2011, NewPage filed for bankruptcy, $3 billion in debt. In Kimberly, the empty mill – whose twin smokestacks are on the city logo – was sold to a liquidation firm. It has been torn down, and everything, including the paper machines, is being sold as scrap. In China, demand for paper has been growing at just over 4% a year and is expected to continue for at least five years. As China pushes to modernize, literacy rates are increasing, a new middle class is growing and the publishing-on-paper industry is booming. German paper machine maker Voith GmbH has built a sprawling campus of assembly buildings, each the size of an airplane hangar, in Kunshan, two hours from Shanghai – an operation dubbed "Paper City." Voith expects China to add additional capacity in the next few years that will equal the capacity of every paper mill now operating in Europe. Of every 12 paper machines the company builds, nine go to China, three to Europe and zero to the United States, where the last new publishing-grade mill was opened in 1990. "America is not competitive," said Mingming Liu, the company’s chief executive in Asia. To Liu, the prime example of entrepreneurship is not that of Apple’s Steve Jobs, but Cheung Yan, a Hong Kong entrepreneur who moved to Los Angeles in 1990, where she created a scrap brokerage to tap into the recycling bins of U.S. homes and offices. Six years later, Yan’s Nine Dragons began to open cardboard mills, then mills that make publishing-grade paper, all across China, fed by the recycled paper that arrives packed into shipping containers, which are unloaded by giant cranes and stacked until they create canyons at China’s ports. The trade imbalance means she can negotiate rock-bottom shipping rates because the vast majority of the containers freighters carry from the United States back to China each year would be empty if not for scrap paper. Indeed, it is now the largest U.S. export to the world by container volume. Those ships will return to the United States filled with goods made in China – laptops and tablets, electronics and high-end computers.